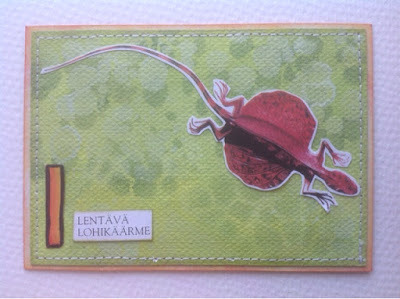 The Craft Barn alpha/dictionary challenge has moved on to the letter L. I shuffled through the index of my wildlife encyclopedia looking for animals that begin with L... and couldn't help stopping at "lentävä lohikäärme" = flying dragon. After googling for more images, I must say that the artist that has drawn for this book really didn't do this lizard right. Check here for beautiful photos and more info in English and even a video. I used the same green canvas as for the falanouc and a stencil to make believe the lizard is gliding in the canopy of the jungle. I've been using these stamps from Rubber Dance for my letters. They are all lower case, and I guess L is about the most boring lower case letter there is :) This little lizard is obviously quite common and lives in small territories covering a few trees per male (+ all the females he can manage... ). This is the back of my card with the description of the flying dragon. 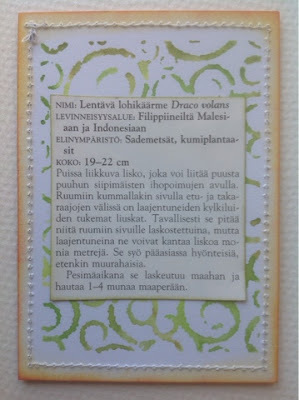 The Swirly background stamp is also from Rubber Dance stamps. The simplicity of this card is fabulous. It makes this card ALL about the flying dragon. And he's a beauty for sure. Perfect color selection. I'm always impressed with your art, because you draw and sketch so well. This is a genuine beauty and a great color combination. Another great card - and another great creature! A very interesting looking creature! Wow, beautiful card, love the backgrounds Kristiina!! Thank you for joining in The Craft Barn Challenge! Fabulous background to display the little lizard.